For years greenkeepers have remained the ‘unsung heroes’ behind tournaments and big events. 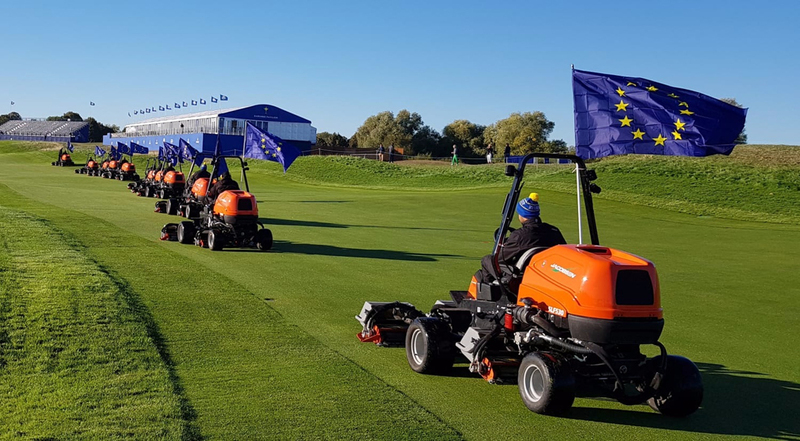 For sure this year’s Ryder Cup coverage was focussed on the players and the matches, but there has been far wider acknowledgement of Le Golf National as perfect hosts, and unprecedented focus for the role of the greenkeeping team. During his opening speech, European Captain, Thomas Bjorn, singled out Alejandro Reyes, Golf Course and Estates Manager at Le Golf National, with appreciation for his pivotal contribution in crafting the course setup. In the final euphoria, Rory McIlroy and the winning European team took the time from his jubilant celebrations to personally meet, greet and embrace the greenkeeping team on the 18th green. This time, the European Tour created its own promotional video of what goes on for course preparation behind the scenes. Other broadcasters and media took advantage of a peak into life in the greenkeeping sheds, to show video footage of turf management practices and personal experiences from the Turf Team Challenge website. Syngenta’s Daniel Lightfoot MG, using his experience gained in the industry, spent a full week with the LGN greenkeeping team in its preparations and over the full tournament. 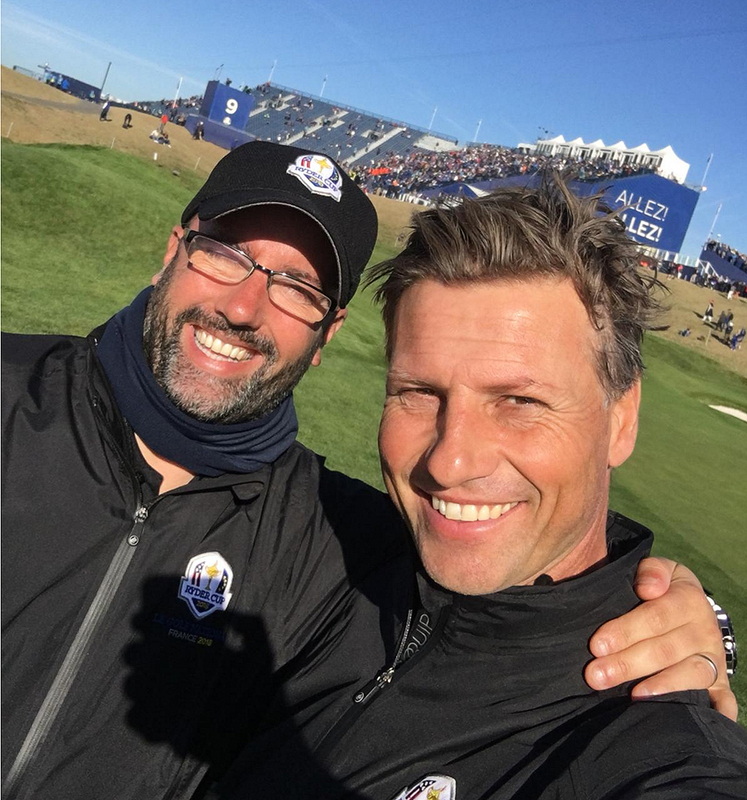 Daniel, above with Syngenta Nordics Business Manager, Lars Tveter, believes volunteering at Le Golf National has been an extremely valuable experience for greenkeepers’ personal and career development. And it doesn’t get any bigger or better than Le Golf National. 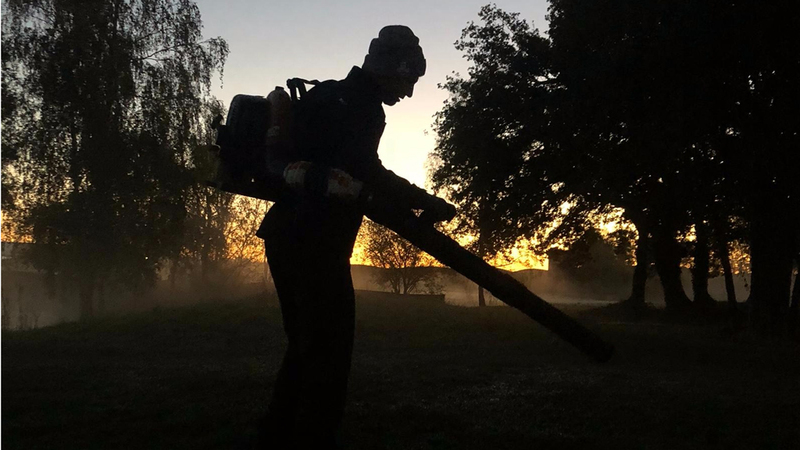 Alejandro Reyes himself has been a keen volunteer at events across the world, citing it brings a new perspective for greenkeepers, and can be an inspiration to introduce new things on their own courses. “For sure, I love to do tournaments!” he enthused. “Between the European Tour and the PGA Tour, I’ve lost count of the number of tournaments I’ve worked on. And every time you work on one you see something different. “You get a picture of something and think ‘ah, that could work on my course’ or ‘we could do it better if we did it like this’. 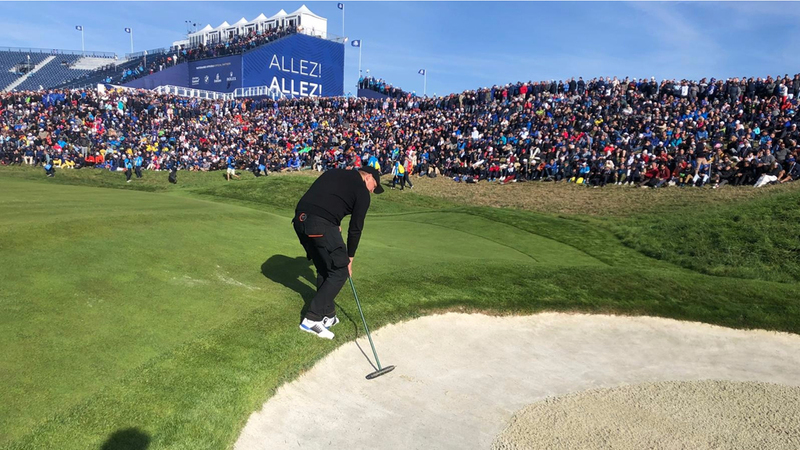 Improving turf density, smoothness and consistency for players has been the key driver for using Primo Maxx II for Tournament preparation at Le Golf National. The team pointed out that players would experience the same playing conditions and pace in the morning, as the last players out in the afternoon. Lucas Pierre, Alejandro’s right-hand man and Head Greenkeeper for the Albatros Course, also reported the difference with the fairways this year using Primo Maxx II, compared to last year without: “When you were cutting the fairway every day, you had to empty the box every five minutes; this year, it’s like the guys are saying ‘you never empty the boxes’ it’s perfect for us. For Lucas, the relationship he has developed with Syngenta has been very important. “For us, this could be one of the successes of the Tournament,” he said. He welcomed the chance to see the range of jobs involved and the opportunity to do a bit of everything. “!It’s the way that they refine every detail and the finishing touches that sets it apart. For Swedish greenkeeper and mechanic, Johan Olsson, the mantra learned at his Le Golf National time has been to ‘check, check and check again’, just to make sure everything is set up precisely and will work perfectly and consistently out on the course. “Then, when they’ve finished the morning session, its check it all again, ready for the evening. It’s just been the biggest thing you can experience, as a greenkeeper or mechanic. “Watching 180 guys move out in the morning; it’s unbelievable, and something I can really recommend,” he added. 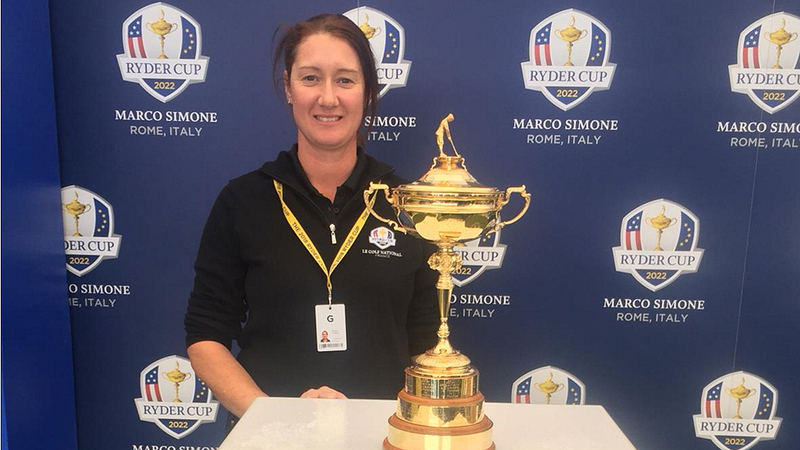 Wendy (above) welcomed the professionalism of all the greenkeepers and organisational staff that had actively encouraged and integrated women working on the team throughout the preparations. “We are all used to working as a minority group, but to be treated exactly the same and given the same responsibilities and jobs for our skills alone has been great experience,” she added. Chloe Gallagher of Sunningdale Golf Club concurred: “Being part of a team with a dozen or more women has been really different and a great experience. South Africa’s Leopard Creek Country Club Golf Course Superintendent, Neville Wenhold, found the whole process of handling the pressure of a big tournament fascinating. “Alejandro has made it a lot easier for us because he’s so professional at what he does. He makes it clear what expects from the team. He prefers for us to make sure that we are doing the right thing, rather than just pushing, pushing, pushing and making a mess along the line. The BBC on-line commentary team summed-up the team’s performance perfectly at the end of the event: “As the sun sets on Le Golf National, the Ryder Cup organisers are getting the presentation ready on the 18th green. The green keeper must be having kittens.